The last time I wrote here on Quill & Pad about my relationship with the world’s greatest mass luxury brand was last year when I explained Why I’ve Never Owned a Rolex – And Why I Might Yet. Well, to know me is to know that if I say I “might yet” buy something it’s likely only a matter of time before I’ve talked myself into its absolute necessity as part of my collection. 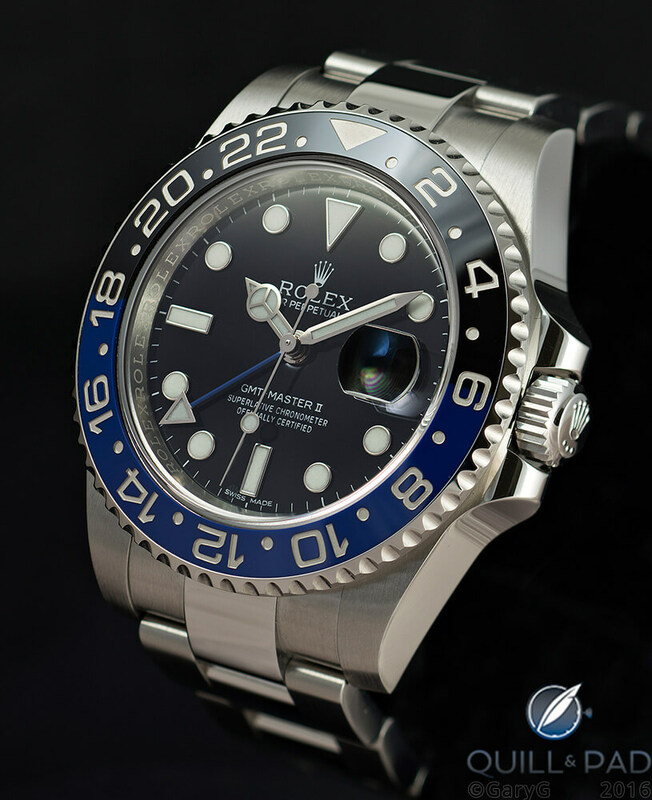 So, too, with Rolex: in this case one of the watches that I mentioned last year as being on my short list, the GMT Master II BLNR “Batman” with black-and-blue bezel. In the “Terry Taxonomy” that our group of collectors applies to our holdings, for me the GMT Master is a “fun” watch: one that scratches an itch at a particular point in time and that is affordable enough that it doesn’t cause sleepless nights once purchased. At the same time, it seems pretty clear that this could be an “investment” piece for me: a watch that sustains a fairly predictable value and that, more importantly, can act as a core piece within a collection. So what suggests that this could be a keeper for me? It took me a while to come up with the right term, but for some reason what came to mind was “highly evolved,” which is a friend’s description of the form-fitting, perspiration-wicking bicycle clothes we wear on our rides. While they are pretty clearly poorly suited to many uses (and in my wife’s view, “flatter no one”) they are darned good for covering miles on the bike. 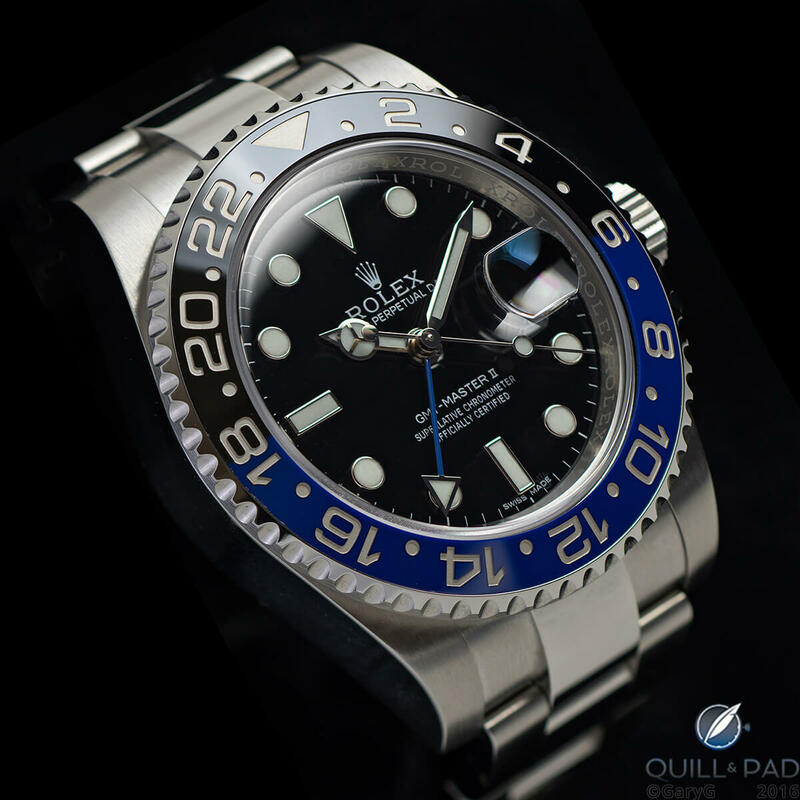 On the first point: if you search online for images using the prompt “Rolex GMT Master II” as I did, what you’ll see is that exactly one of the first 200 images popping up shows the back side of the watch. While it’s not too surprising that for any watch that there are more shots of the front than the back, by comparison nine of the first 100 image search results for “Patek Philippe Nautilus” show the reverse side. My own experience is that the time that I spend considering the view of the back of the Batman is pretty much zero. And that’s just fine because Rolex has incorporated so many features that make the on-wrist view appealing, from the sharp edges of the crown to the platinum-plated recessed numerals in the bezel and the matching blue colors of the striking Cerachrom bezel and home-time hand. When you pull up your sleeve to see the time, this watch looks good! The blue/black color motif works, the time is clearly legible, the central sweep seconds hand gives a pleasant sense of the orderly passage of time, and the anti-reflective coating does its job with distinction. The concept of purposeful evolution extends to the mechanics as well. The mid-2000s Caliber 3186 movement builds on the Caliber 3185 introduced twenty years earlier by adding a more temperature- and magnetism-insensitive Parachrom hairspring. And it more effectively isolates the adjustable local time hour hand from the fixed home time indicator. I think that most of the functional design choices made by Rolex make great sense. For instance, the movement hacks when you set the main time indications so that you can synchronize these to a reference, but does not hack when you adjust the hour indication of local time, the better to maintain that synchronization. And in terms of being presentable, a steel Rolex is hard to beat. Many of my business clients wear similar pieces; and when visiting my longstanding global energy industry client, the “Texas Timex” is almost a part of the executive uniform. While I think of myself as a buy-and-hold collector, I do sell from time to time. Over the past several years, I’ve worked pretty diligently to curate my collection by selling pieces I don’t absolutely love, converting the sale of several small pieces into the purchase of a smaller number of more important ones and eliminating overlaps. If my GMT Master II ultimately goes to a new home, it’s most likely that it will be during a cycle of selling-to-buy in which I find something new that I just must have and in the interests of fiscal sanity decide I need to consolidate some other pieces to raise funds. Short of that, there are a few things that may cool my ardor. The Goldilocks Syndrome: Put simply, as a Rolex this watch may be too conspicuous for its level of distinction and not special enough to justify the attention it draws. To fly below the radar and still smile each time I slide my watch out from under my sleeve, I may be better off wearing my Vacheron Constantin Overseas, which is a more sophisticated, more expensive watch that draws less notice from the envious and larcenous. Rolex Batman vs. Vacheron Constantin Overseas: one, both, or neither? Industrial excellence: I really do deeply admire how fine a watch Rolex is able to make with what is clearly a highly automated, industrial production model. But over time, I may find that the implications of that model, such as the slab-sided, sharp-edged, flat-backed case design, start to wear on me. Rolex GMT Master II: too hot, too cold, or just right? Fortress mentality: It’s no secret – Rolexes are desirable enough that there are many people in the world looking to cash in by counterfeiting the Rolex look. Rolex fights this in many ways, including randomizing serial numbers; engraving both the serial number and “Rolex” notations on the flange; hiding secret signatures elsewhere; and I’m sure in other ways that are not clearly evident to the observer. That’s all great, but will it start to bug me that many of the visual elements I see when I look at my watch are there for the purpose of fraud prevention? At the end of the day, I suspect that this “experiment” will end with the GMT Master II as part of my regular wearing rotation – and perhaps as a long-term go-to piece. One of my top criteria for a watch is coherence: does everything about the watch make sense in the context of the unified whole? And is the total package consistent with the brand’s personality and promise? In this case my conclusion is yes. Part of the brilliance of this watch is that it omits all that it does not explicitly include, and what it includes it does so without apology. Don’t like the raised “Cyclops” lens on the crystal, prominent hour markers, or stamped hands? Buy something else. Yes, I have some quibbles. I find it hard to believe that in this day and age there is such a thing as a calendar watch without a dedicated quickset date mechanism – the GMT Master requires the user to spin the travel time hand forward or backward through entire days to change the date. While I’m at it, I should note that finding the right crown positions for winding, setting home time, and adjusting travel time is more challenging than it should be for a travel watch. And on my example at least, the timekeeping is consistent across positions but not within Rolex’s advertised plus-minus-two-seconds-per-day benchmark, at least according to my timing app. Bottom line: am I becoming a Rolex guy? In terms of pursuing additional Rolex watches for my collection or seeing Rolex as an aspirational brand, I’m not. 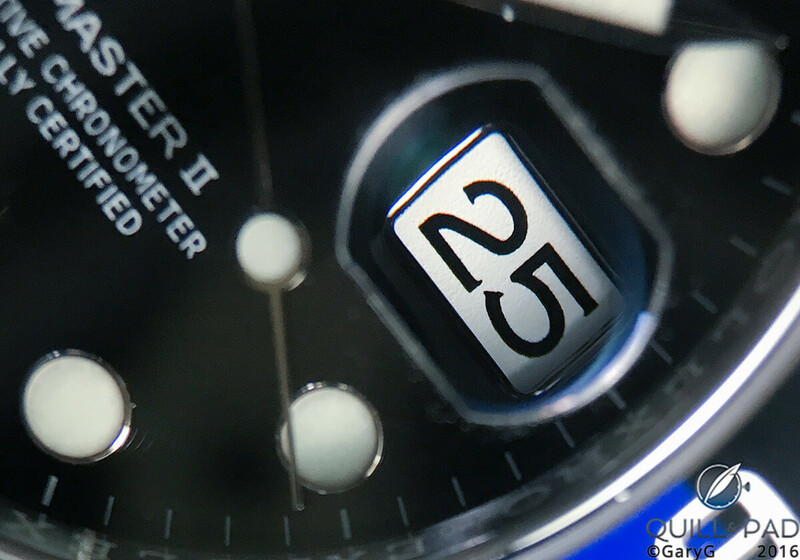 But, at least for now, when it comes to the GMT Master II I’m feeling the love. For more information, please visit www.rolex.com/gmt-master-ii. This article was first published on April 19, 2016 at Great Rolex Experiment With The GMT Master II Or How I Learned To Stop Worrying And Love The Crown. Great post As always Gary! As a sophomore collector, I’ve always been drawn to dress watches, thus mostly uninterested in the crown’s offerings, though still a brand I’d recommend without hesitation. Very interesting and wholly unique observations about what may or may not make this a permanent piece in your collection. You’ve mentioned design features and associated perspectives I’ve never read before. Thanks again for honest writing, and congratulations on your 1st crown! Hey there, I am new to Quill and Pad but I immediately learned the value of your articles. I can certainly understand your apprehension to buying a Rolex as it really does draw attention and is also painfully common. But who cares! In my opinion, a real watch guy doesn’t care about how common his watch is but buys it based on its excellent chronometer certified in-house automatric movement, the space-age steel quality, and the comfortable and useful indication with outstanding aesthetic and I know for sure that you are a real watch guy. Apprehension is natural but you would be missing out if you didn;t have at least 1 Proffessional Rolex in your collection. I’ve owned Lange, Voutilainen, Gronefeld, Patek Phillippe, and Journe, and a few beaters, but never a Rolex. I’m proud of that fact. Also, I can wear any of my watches anywhere, and I don’t need to give a second thought to unwanted/unneeded attention from amateurs. Nothing wrong with contemporary Rolex, for the masses. One thing that makes it more likely than most to be let go is that it holds it’s value so well.. When the time comes and something needs to be turned into money, inevitably you’ll lose the least money letting go of this one..
BTW: is it really -3.6 in real world use? I don’t trust timing apps all that much on this, I think it’s easy enough to see after wearing it a week where you ended up. And if you ended up at almost half a minute slow after a week then I would not be very happy, personally.